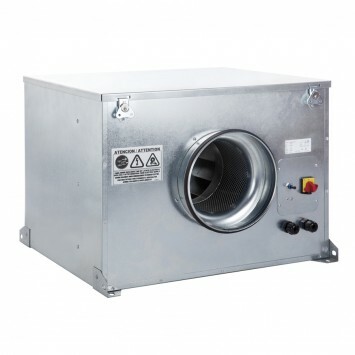 Low profile acoustic cabinet fans, manufactured from galvanised sheet steel and internally lined with 50mm thickness of fireproof acoustic insulation (M0), with sound-absorbent insulation at the inlet. All models incorporate inlet and discharge circular duct connection flanges with integrated rubber air seal. Direct drive backward curved centrifugal fan. Brushless EC motor, IP44, with thermal overload protection, suitable for single phase supply 230V +/- 15%- 50/60Hz. Fan supply with external ON-OFF electrical isolation switch, and potentiometer to adjust the fan speed. Also possible to control the fan speed with external potentiometer type REB-ECOWATT or analogue input signal 0-10V. This cabinet fan has been designed for indoor use, with inlet air temperatures between -20ﾺC up to +40ﾺC and suitable for mounting in any orientation.